The first in a series of guides to the very best of free resources to help you track, grow and, ultimately, profit from your Twitter account, today we will look at Followerwonk. This is the ideal tool for a social media audit and can be used prior to the creation of an account, all the way through to enhancing even the most prominent communities. The “Analyse Followers” tab allows you to either assess the accounts that someone followers, or the followers of their account. This can be invaluable in identifying where a competitor has the jump on you; are they connected with and regularly communicating with, someone who has a very high social authority, or an industry figurehead? Are they just being followed by spam accounts, and therefore does their high number of followers actually mean anything? However, beyond the corporate espionage possibilities lies a wealth of data that can help your account to transcend the competitors and become an essential business channel. Is your business global? It could be without you realising! 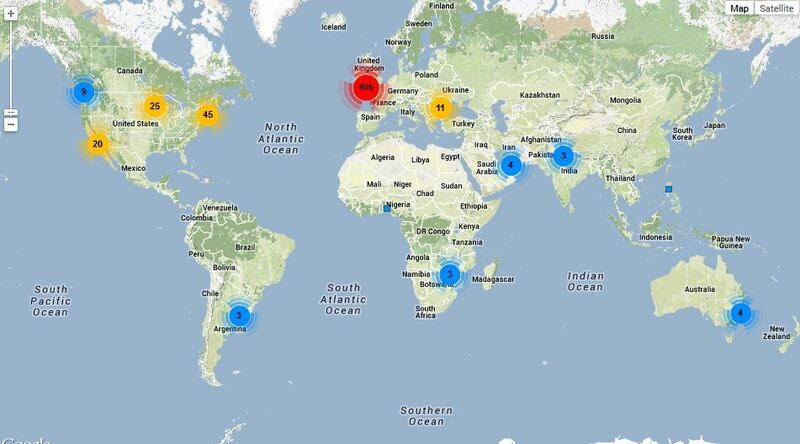 Followerwonk maps the geographic location of your followers, helping you to understand who is following you and where. This is great for tailoring content. This is the golden goose, the piece de resistance and the coup de grace all rolled into one. Ever wondered why your well written tweet hasn’t been shared or why those around you seem to be getting great interaction when you’re not? It could be as simple as sending your tweets at the wrong time – and Followerwonk is here to help! The simple table below shows the time ranges when your followers are most active. In order to make the most of your followerbase you need to match their habits. For example, I can see that @ThisisPRable needs to issue the majority of its tweets at either 10am or 5pm to get maximum reach. Be sure to review this regularly as it can change overnight. To make the most of the information above, Followerwonk kindly provides you with data on your most active hours. The information is broken down into when you are most likely to tweet, retweet or engage in coversations. Clearly I need to make sure that I issue more at 10am to be inline with my followers’ needs (and I should also stop tweeting at 1am to avoid my eyebags getting darker still). Are your followers the ones that you want? Those with a higher social authority score carry a greater weight and are key influencers online. The score is composed of the retweet rate of the users’ last few hundred tweet; how recently and regularly those tweets are posted; and based on their own user profile data. Ultimately you want the darker sections to be as big as possible, but if you have a larger segment in the middle then you’re doing pretty well. Clicking on one of the score categories (e.g. 21-30) will open a pop-up with information on all followers in that score window – ideal for seeing who you need to connect with more often. When you content is being retweeted you want it to reach as wide an audience as possible. Much like the social authority score above, the larger the dark segments the better. Not as useful as the graph above, analysing the following counts of your followers can show their social value. Those who follow everyone are usually less useful than those who have a more targeted approach – remember that specificity is a real benefit on Twitter. Are your followers long-term users or recent adopters. While newbies are still valuable, those who have been present on Twitter for longer are much more likely to have a higher social authority and to be genuine accounts. We all want followers who are regularly online and engaging with us. Therefore, if your followers haven’t tweeted in three years, they probably aren’t going to buy anything you’re selling any time soon. Sharing is caring. Followers with a higher percentage of regular retweets are going to be much more valuable to your account. While it may be difficult to change their behaviour patterns, it may highlight that you need to change your approach to grab their attention. Creating conversations and keeping engaged with your audience is fundamental to longevity, popularity and success. Those followers with a greater disposition to engaging in conversations are considerably more valuable and they are more likely to speak with you, provide feedback and recommend your account. Saying the right thing is key when so many accounts are competing for our attention. The bio word count draws out the most common terms from your followers’ biographies and can help you to identify the words that you need to use most often to get noticed. There are a number of other analytics available through Followerwonk, but I believe that those listed above have both the greatest number of applications and the greatest power to change your social media work for the better. You can be as in-depth as you wish, by clicking though to the various hyperlinked subsections, or simply use it as an overview tool. Followerwork does have pay options and can be connected with other Moz offerings, but as a free tool it should be an essential part of your everyday social media routine. I’ve been using Followerwonk for nearly two years now and it has been one of the most important tools that I use on a daily basis. As a social media community manager these tools are invaluable in the building of a successful twitter community as well as making sure your content is being viewed by the right people at the right time. Kudos, PRable!